Entertainment Weekly reports that late-night host Jimmy Kimmel will guest host episode three of this season of The Bachelor, which may sound like a cheap cross-promotional gimmick for ABC but rest assured is a cheap cross-promotional gimmick for ABC. Regular host Chris Harrison will apparently step aside for the duration of Kimmel’s appearance, perhaps to continue plotting the death of his archnemesis Juan Pablo. In what will surely be an exciting change of pace on a show that turns marriage courtship into a cattle call, Kimmel will be subjecting contestants to a relay race with a farm theme. The women will be competing to milk a goat, shovel manure, wrestle a greased pig, and other typical romance stuff. 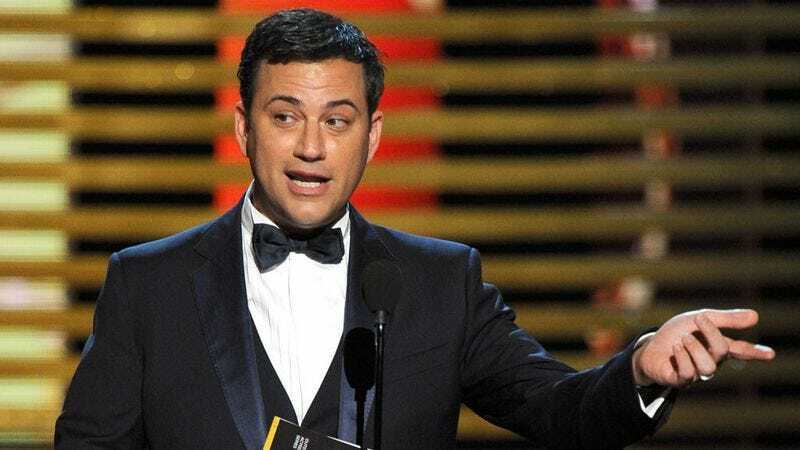 The show’s young, rich, educated audience will also no doubt enjoy Kimmel pranking new bachelor Chris Soules’ one-on-one date, as well as seeing Kimmel wind up in a hot tub. So, basically all Kimmel, all the time, at least for this one episode. The network also teased that the relay race ends when “an underdog beats out a brash woman in top physical shape,” who will likely turn out to be Kimmel as well. The episode will then end with Chris Soules ripping off his face to reveal that he is also Jimmy Kimmel. The Bachelor airs Mondays at 8 PM on ABC.